When I was 12 or 13, my sister bought me a book for my birthday. It was a tattered ex-library copy with some funny, detailed, cartoonish drawings on the front, drawings of an old fashioned treasure chest with lots of tiny little feet coming out the bottom, and troll-like figures standing in a doorway. I thought she’d cheaped out on my birthday present, that’d she’d just thought “Ally likes books, I’ll see what I can find at the library booksale for 20p”. But she talked with such animated enthusiasm about it that I decided to ignore the state of it and give it a go. That book was Terry Pratchett’s The Colour of Magic. And from that point on, I was hooked. I soon got through the small selection of Discworld books at my school library and went on to saving up all my pocket money (which, when I was 13, was £1.30 a week) to spend it on these £7 books instead of the sweets and toys I’d previously spent it on. They were funny, well-written, and opened my eyes to the enormity that the fantasy genre could encompass; it wasn’t all dragons or mice living in abbeys or bespectacled boy wizards. What my sister had introduced me to wasn’t just a story, but a whole new world, a world of nuance and wit, a world which was a mirror reflecting back both the world I occupied and the stories I was already reading, and pointing and laughing at them all. In the following years, when I was bullied at school or did badly in a test or when my cat Caterpillar died or I broke up with a boyfriend, or even when my mood was dark and unpleasant following the darker themes of other books, it was to Discworld I turned, where I buried my nose in the pages and forgot my troubles. 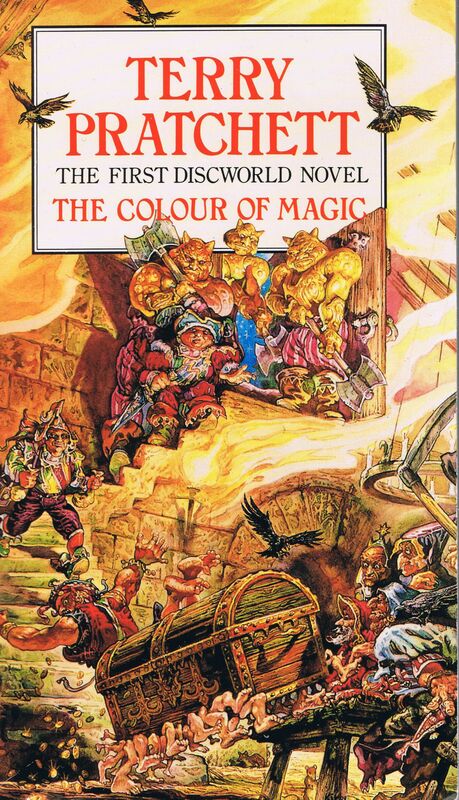 When the non-Discworld book Nation was published, like many Pratchett books before it I read it by torchlight under the covers late into the night. But unlike any book I’d ever read before, or any since, I briefly was so consumed by it that I forgot myself, forgot that I was me, reading a book at night by torchlight, and simply existed in the state of being a reader. When the chapter ended and I came back to Earth my skin tingled and I suddenly felt hyper-aware of my senses, of the feel of my duvet cover on my skin, the texture of the pages under my fingers, the silence of the house, and the brightness of the red display of my clock which declared the time to be quarter past two in the morning and reminded me that I was tired. Often when I finished reading a Pratchett book, the next thing I wanted to do was get on my computer and write. That’s not the case with every book I read, even the good ones. I even attempted humour, though was never very good at it, including a story in which “Rapunzel” was imprisoned in that tower because she was a werewolf. When I had to thin out my books, both before I left for uni and when, having returned, it was time to move out of my parents’ house, the Pratchetts remained where literally hundreds of other books were bagged up and taken down to my local library or the local secondary school for their library. It is not an understatement, then, to say that Sir Terry Pratchett touched my life. He inspired me, made me laugh, made me cry, made me re-examine my prejudices – starting, that first day, with judging a book by its cover, or rather the state the cover was in. It is rare that I cry at the death of someone I never met, but I always knew that there were some people whose words and work had inspired and influenced and entertained me, at whose deaths I would cry. Terry Pratchett was always top of that list. And so I did, yesterday when I heard the news and again every time I read a touching tribute from one of his millions of fans, and right now as I write this. Sir Pterry, your hourglass has run out of sand, but the hourglass of your influence is infinite.